So, I'm going on vacation. I leave early tomorrow morning and likely won't visit my blog until at least Feb 4th, which means of course that I won't be visiting any other blogs either until then lol. I'm sure I will have a bazillion things to catch up on. I don't know how I'm going to handle not being on the computer for a week and 1/2! Also, typepad users, I'm not ignoring you! For some reason I have not been able to comment on typepad accounts for the last few days. I don't know why, it just doesn't work. So I'm really sorry. To Antique Mommy- "LOL", to Chilihead- "Happy Bday Max! ", to Shannon- "Aw, sad the crib is put away and LOL at killing the chickens! ", and Tammy- "great pics!" Don't have too much fun while I'm gone! Most of this is about Cancun lol. 2) Monday we leave for Cancun! 3) The resort we are staying at is awesome!!! Can you tell I'm really excited about my trip?! I can't believe in just a few days I'll be on my way to warm, sunny Cancun! I get to get out of this cold and snow, and I will actually get to sleep uninterrupted by Baby! I take a lot of pictures of my cute kiddos, but rarely get them developed. I just download them from my camera to my computer, where they sit until I need them. They are easy to share online. Whoever invented digital cameras is a genius. The problem starts when you don't have some type of backup of your digital pictures (or any other important file on your computer). Things accidentally get erased sometimes, digital memory can get messed up, or the biggest problem- computer crash. I learned my lesson the hard way. 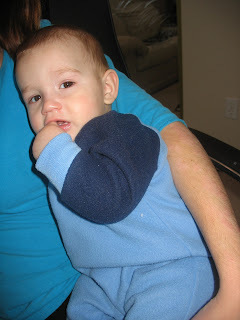 When my Toddler was 1, our computer hard-drive crashed, taking with it almost all the pictures I had of his first year, including holidays, birthday, 1st steps, all the important things. I was devastated! Luckily we were able to take it to a data recovery place and get all our files back (though we had to pay a small fortune), but now I know better. Periodically I save all my pictures and important files to CDs. Now if something happens to the computer I will know my pics are safe and sound. What also works is if you have an external removable hard-drive, you can save copies of your files to that. It works for me! Check out Shannon at Rocks In My Dryer for more WFMW tips. I've been tagged by Skittles for this MEME. 1) I have Psoriasis. It's an immune system disease that makes me have red, itchy, scaly skin on my arms, legs, face, and scalp. 2) I only had 2 real boyfriends before I met hubby. One when I was 14 and the other when I was 17, both only lasted a few months. What a loser huh? 3) I've never had drugs or alcohol. 4) I used to dance, ballet, jazz, a little tap. Started when I was 4 I think, stopped when I was 17. 5) I was born at home. That was hard! OK, I tag Michelle, cuz I love learning more about my friends! Spotlight today is on Skittles! I came across Barb's blog a few months ago and was hooked from the start. She is funny and honest and kind. She posts a lot (my inspiration lol) and keeps her viewers entertained. From her cute little "Just a Quickie" posts to more serious life issues, she will keep you coming back for more. One of my favorite things about her is how she doesn't pretend to be what she's not. She is very honest about her life, ups and downs, and her honesty has earned her many faithful friends and readers. She is always encouraging others and comments frequently to her many blogging buddies. I'm happy to count her as one of my good online friends. So go check her out and tell her I sent you! OK, so the first rule of buying shoes is to buy new right? I mean you don't want to wear shoes that someone has been sweating in and worn out. Well, I broke the rule. I bought some shoes at Goodwill, we don't have lots of money and I just needed something to wear a few hrs a night at work. And stupid me, I didn't even think to wash them before use. Now me toes are killing me! Like burning, itching pain. Feels like horrible blisters but it's not, just pain. I'm praying that I didn't get some infection from those dang used shoes. Hopefully they just hurt from getting used to wearing the shoes and not from some raging infection under the skin. I'm going to go soak my feet for a bit. Arg, now it won't let me put pics up! Stupid stupid stupid! I'm trying to do a spotlight but can't put up the pic :P Guess I'll wait until later. Check out the resort we'll be staying at! Holy cow it's nice! I've never stayed somewhere so nice, I'm soooo excited! I think that's it! My trip packing got bumped up a few days cuz we the flight leaves Monday, but we have to go out of town Friday, so I need to be done packing by Thursday night. I'll be in Cancun in less than a week!!! Normal day today. I need to finish laundry and actually fold and put it away. Clean up the messes Toddler is making. Dishes are mostly done. My tummy hurts which means it is lunchtime, better get something to eat. I work at 5, like usual. Yesterday we were gone most of the day, so I just spent an hour catching up on blogs. Baby is fussy, those dang teeth are just taking too long to pop through! And Toddler is making messes and his dirty diaper could kill a skunk so I need to go catch him and clean him up. Have a great day! First day in a long time I haven't posted a lot. Been at church, then drove to Inlaws and just got home a little while ago. Sorry I didn't make it around to blogs today! I'll go comment to everyone tomorrow :) I'm soooo sad Patriots lost today and aren't going to the Super Bowl, they totally screwed up the second half of the game :P Anyway, I'm off to bed! Today is a nice lazy day. Watching T.V., reading, hubby cleaning up while I just lay around. :D I am going to go fold some laundry and file papers though. It's just nice to have a relaxing day once in a while. So for the last few weeks my habit has been to clean one hour each day. I have not always done it, the last few days I've hardly done any at all, but because I have done it most days my house really is getting cleaner. Laundry and dishes are staying done, and there isn't as much to pick up. I also added on last wee, to get dishes done by putting dirty dishes in the dishwasher right away and unloading it once it's done. There have been a few times where I haven't gotten to it right away but for the most part it's been done. I don't have huge piles of dishes cluttering the sink and counter. So, I'm going to keep working on these goals, and start a new one today. My new goal is to brush my teeth twice a day. I should be doing that already, in fact I'm supposed to brush a whole lot more than that because I wear braces, but I was never instilled with good teeth cleaning habits and it is hard for me to remember. So twice a day is my goal for now. Head over to The Lazy Organizer to join in SMART Habit Saturday! Naptime and bedtime for Toddler are usually very easy at our house. He might whine about going to sleep but once we put him in bed he stays there and puts himself to sleep. I feel so lucky that it's that easy. I get back to the door, try to open it, and...."Crap!" I quickly go through my list of options. The windows are impossible to open from outside so that's out, all the door's are always locked, the garage only opens with the opener button, and the one person who might be able to let me in is up in bed! I could go to the neighbors and call hubby, hoping he has a house key, then wait 45 mins for him to get there, but that would take too long, who knows what could happen to the kids in that time! Baby could fall down the stairs, I had macaroni boiling on the stove, all sorts of things could go wrong. I could call the police or a locksmith and end up looking like an idiot and horrible mom. I decided to just try to get Toddler to come downstairs and let me in. For about 5 minutes I pounded on the door, rang the doorbell over and over, and called his name as loud as I could without getting the whole neighborhood to come out and see what was wrong. I kept peeking in the window to check on Baby and see if Toddler was there. Baby was happily watching a movie but still no sign of Toddler. Just as I was getting ready to give up and go next door I look in the window one last time and jumped about a foot, Toddler was standing right there looking at me lol. I told him to open the door for Mommy and he nodded and ran to the door. I wasn't sure if he'd be able to since he never has and it's a bit harder to open than our other doors, so I crossed my fingers and after about 15 seconds he managed to get it open. I ran in, scooped him in my arms and kept saying, "Thank you for opening the door for Mommy! You're such a good boy! I love you so much! Now you have to go back to bed." He was so proud of himself and was smiling as I put him back in bed. I don't know if I can deal with so much excitement in my daily life! For 5 minutes I had no control over what could happen to my kids and it was terrifying, all those 'what if's' running around in my head. From now on we are hiding a house key outside! Appetizer: Which television shows do you just refuse to miss? I love ER, but I usually work, but I try not to miss too much. Soup: Who did you last speak to on the telephone? My hubby last night when I got off work. Dessert: What is your favorite foreign food? Chinese, mmm yummy sweet n sour chicken and chow mein. I almost forgot! I just reached 200 posts a post or two ago! Hurray! 5) Hubby stayed home from work today so I have help. A friend showed me this post. I think it's good for all mothers to read. I'm being lazy today. I keep procrastinating. I need to go to the library to pick up some stuff, and to yell at them about a book they say is overdue that I returned last week. I also need to pick up a few things at the store, I just don't want to go out. It's a lot harder to just run a few errands with 2 little boys in tow. A fellow blogger, Kelli, is in need of help. She is on dialysis, in desperate need of a kidney transplant. She is so sweet, and has an amazing ability to see the good all around her. Boomama has set up a fund for her, so people can go donate a little to help her out, as her insurance is up this month and she will be on COBRA which costs a whole lot more. You are not required to donate anything, but even prayers would be much appreciated. Check it out here. OK, what to do today? "I was 44 when I had my baby. This blog chronicles the joys and challenges of living in the brave new world of hot flashes, sloppy cookie kisses and trimming itty bitty fingernails while wearing bi-focals. Sometimes sweet, sometimes tart, but always real." Each post is full of humor and cute little stories about her life. Read about her always-hilarious trips to Wal*Mart, the funny things her son does, and tales of her OCD. You will be rolling on the floor laughing with every post. She makes even the most mundane activity into an adventure and makes me want to find humor in every day life. So go check her out now! I promise you'll be hooked! Well, I had this all thought out earlier about what I was going to post (yes, I now go throughout my day thinking about what I can blog about lol) but now I can't remember. :P I can't even remember what the talks were on. Ah yes, one was on the importance of parents teaching their children important Gospel principles at home and something like that. (Obviously I wasn't paying very good attention! Kids kinda make it hard to listen.) But I did enjoy what I heard, even if I don't remember it, it was a peaceful meeting. And now I'm off to watch some Sunday football. OK, last week I set my goal to do housework for 1 hr each day (except Sundays). I did pretty good, but Thursday I didn't do any and Friday I only did about 1/2hr. So I'm going to keep this as a goal until it becomes a habit. And I'm going to share a story about how keeping things clean can save you money. I hate doing dishes and so they got piled up pretty high the last few days. Well, my cats love that because then they get on the counter and eat off the dishes. Unfortunately when you have dishes precariously stacked near the edge of the counter, a cat can knock them off pretty easily. We now have one less bowl and small plate. If I'd done dishes earlier like I should have that wouldn't have happened. Soon we're going to have to buy new dishes if that keeps happening. So putting off my housework costs me money. I'm going to add a little sub-goal to my cleaning goal. It is to empty the dishwasher as soon as it's done and put dirty dishes in it as they get used so I can run it when it's full. Hopefully by doing this I can avoid dishes crashing onto the floor! Check out The Lazy Organizer to learn more about SMART Habit Saturday and join in the fun! Fezzik: "We face each other as God intended. Sportsmanlike. No tricks, no weapons, skill against skill alone." Man in Black: "You mean, you'll put down your rock and I'll put down my sword, and we'll try and kill each other like civilized people?" I love that show :D Such a classic. Well, National Delurk Week is coming to a close and I think I still have lots of lurkers, so I'm calling you out! Don't try to hide, I can see you! Yes, you over there sipping your Diet Coke and you in the back with the funky glasses! Come out and say hi! So last week Toddler got sick, and then kindly passed it on to Hubby. I was grateful that Baby and myself had been spared, but yesterday Baby started showing signs of it. I passed it off as teething, and hoped that I was right, but I wasn't. Last night he hardly slept, he was miserable with coughing, runny nose, and a fever. Today he is just so sad looking, you know that pathetic, pity-me look they get when they are sick? Poor little guy. Plus Toddler still has it too, so I have 2 little sickies running around, and my other big sicky is at work sneezing up a storm. The one good thing about the kids being sick is how cuddly they get. It's so adorable, they just want to be cuddled and loved. Baby is sitting in my lap being adorable despite his snot-covered face. Another bonus is Baby naps more when he's sick so I can relax a bit. I'm hoping the sickness will still pass me over but now that I'm the only one left to go to, it probably won't. I'm not wearing my contact today so I can't see well. Please forgive any spelling and grammar errors that I might miss. I even have the font set to huge on my screen and it's still fuzzy lol. I wish I had glasses to use when I have my contact out. I only wear a contact in one eye because my right eye is almost 20/20, but my left eye is really bad. I should see a Dr. sometime, I'm almost out of contacts. I was the goody-two-shoes type. The only time I got in trouble was because me and my friend's were pushing each other back in the hall, so we got written up cuz we "Might have hurt other students". I was angry about it cuz that one write up made it so I couldn't be on the high honor roll that quarter. Pepperoni. I love just pepperoni. Though sometimes I'm in the mood for pepperoni with olives, or supreme. But Pepperoni is my all time favorite. Right now it's red and green with a diamond-type pattern on it. I also have 3-4 others I switch around. Holy cow, I can't believe I almost forgot to do this! 5) Nice cold water, mmm, now I'm thirsty! Me: OK, so do you want cereal? Me: Do you want oatmeal? Me: Well, what do you want to eat? Me: You need to eat breakfast, what will you eat? *Repeat daily until you give up or go insane. So, I'm beginning to think my blog is boring. I don't get many comments. Maybe I post too much? Instead of waiting for something really exciting or funny, I get bored easily and just want to post something. Maybe I should get a life lol. Why, out of all the many writing utensils we have laying around, does 2 yr old only want to use the permanent markers? Seriously? He can have crayons, pens, pencils, colored pencils, washable markers, etc all in reach, but instead he has to climb on top of the desk or even entertainment center to get to the permanent markers. Is he already wanting to leave his mark on the world? Or maybe he thinks I need the exercise running after him then scrubbing the walls, floors, books, and him down? We go through Mr. Clean Magic Erasers faster than they can produce them! We should buy stock in it. And those Scotch Brite rip-offs? They aren't worth the foam crap they are made with, seriously, they just aren't up to cleaning 2yr old's messes. They fall to pieces in surrender. I'm thinking of either painting the walls black so you can't see where he colors, or fixing giant pads of paper to all the walls so I can just rip off a used one and have a clean wall again. Hm, disposable walls...nah, probably wouldn't work. So I'm thinking of changing the colors of my layout here, which would mean I'd probably need to make a new Title banner thing to match, but I'm not sure what I want. I want something fun, that captures the mood here. Any ideas? Maybe purple and green? Or pink and brown? Popcorn is for eating right? 2yr old seems to think it's something you dump on the floor and stomp all over. So, either he's wrong, or I missed the memo that it is now a toy and not a food. Today's WFMW is the Healthy Eating Edition. Unfortunately I rarely cook, and when I do it's not usually really healthy, so I don't know any healthy recipes off the top of my head. So I'll just point you in the direction you can go to get healthy. www.sparkpeople.com is a great resource for anyone working on getting healthy. You get food planners, exercise goals, nutritional information, message boards, recipes, and a ton of articles from experts on eating right and exercising. And best of all, it's absolutely free! So check it out, and check out Rocks In My Dryer for more great tips and healthy recipes! Wanna know how many times I've been forced happily sat down to watch Cars today? 4. I have the whole thing memorized by now. It's a good cute movie, but gosh. The things a mom will do for a sick toddler. So Michelle posted about this lotion a little while ago. It is called Renew, by Melaleuca. She said it has really helped her daughters' eczema. I went to her house one day and saw for myself how much better her baby's skin was and wondered if it would help my psoriasis, which has gotten really bad lately. She was kind enough to give me a little trial size lotion to take home. In the first day I noticed my psoriasis looked less irritated and red and my skin felt smoother. I've been using it less than a week now and I'd say there is about a 50% improvement in my skin. It's not all scaly and flaky, the redness is seriously reduced, and I rarely itch any more. I can't believe the difference it has made in such a short time, I can only imagine how it'll be after extended use. I was looking for some kind of miracle to make my skin look better before we go to Cancun in a few weeks and this is it! (And holy cow I just realized we are leaving for Cancun in less than 3 weeks!) And to make it even better, this lotion is just a fraction of the price of the lotion I have been using. The cream I was using before was $40+ for 1oz! One measly little ounce that I had to go light on so I wouldn't go through it too quick and have to buy more. I could've gone through that in a week if I'd used it as often as I really needed. Well, I can get Renew for....$27 for 2-20oz bottles! Holy cow! I get 40x the amount of lotion for almost $15 less! How cool is that!? I am definitely going to be using this from now on! That's all that really needs done, but I'm sure there's a few other things I can do too. Here's some of the things 2yr old says. Can you guess what he means? I just realized that I forgot to put my work clothes in the wash first so I could be sure they'd be clean in time, silly me. Hopefully they will be dry before I need to go! Time to get back to folding laundry while the boys are watching Cars. Wow, I totally loved this book! I don't know why I put of reading it for so long. If Michelle hadn't let me borrow it I don't know if I ever would have read it. I love fantasy books with dragons, magic, etc so who knows why I didn't want to read it before. Whatever the reason, I'm really glad I read it. And it only took 2 days. I could hardly put it down, there was a new adventure on practically every page! I don't want to spoil it for anyone who hasn't read it, but the main character is an ordinary poor farm boy who finds a dragon egg, and after that his life gets REALLY interesting! It was a great book! Before I read it I figured it would be a book for older kids/young teens, but was actually surprised at the maturity of it and that it was probably more suited towards older teens/adults. I can't wait to get the second one to read. Well, my house is a mess so I need to get some cleaning done. And I better do it while Baby is still talking happily to himself in bed. I haven't even eaten breakfast yet. I can hear 2yr old throwing blocks downstairs. I have work at 5 today. We got a new kitten which 2yr old has named Color, ironic since she's pure black lol. She's adorable and very playful. I haven't gotten dressed for the day yet, I really need to do laundry, I think all my work clothes are dirty. I started reading "Eragon" a few days ago and haven't been able to put it down, I should finish today. Does anyone know if the movie is as good as the book? Well, Baby's getting a little fussy so I better go. Okay I'm now part of the rapidly growing Parenting Blogs Directory at www.5minutesformom.com. Have you been there yet? There are so many wonderful mommy and parenting blogs listed you could read all day. And they also have a mom-owned store directory where they list everything from handmade hair clips to kids golf carts. Click over and have a look. We have church at 9am this year, instead of 11am like last year. I am not a morning person. I predict we will be late. Thanks to Lara at Lazy Organizer for hosting this. Basically it is a challenge to start a habit that will Save Money Associations Resources and Time (SMART). Mine today is to spend 1 hour each day cleaning. That doesn't mean it has to be all together, but at least 1 hour each day should be spent cleaning my pigsty home. This may not seem like a lot to most people, but I have to admit that I have let the computer take over my life way too much and I rarely get anything done. I think if I spend 1 hour a day cleaning, in just a week my house will be staying pretty clean and I can start using some of that hour for the deeper cleaning that I normally don't do. And since I won't be home half of today, I'm going to get started on today's hour right now! I think this is a great quote! When you are confused or feel lost and like the world is all dark and you can't see the light, you have to just keep going and trust that God knows what he's doing and will get you through. I think it's especially powerful because it comes from a Holocaust survivor. What do you think? I'm pretty proud of myself! I'll still be fiddling around with it for awhile until I get it just right, but it's mostly done! I now know more about html than I ever want to know lol. P.S. If anyone can give me hints on how to get a line or bar or something that goes vertically between each column I would most appreciate it Nevermind, I figured that out, now I just don't know why there's a space at the top of my recent posts, like a bigger gap between the header and most recent posts. It's lower than the top of the sidebars, and I can't figure out why? P.P.S. I give lots of credit to Random Bytes for her tips on how to switch to 3 columns, easiest help I could find to do it. It's 11:45am and I just barely got around to putting pants on. How sad is that? Today I'm going to tell you a story about a girl who met a boy, fell in love, and lived happily ever after :D That girl is me. I was 18 when I went off to college. I moved into the dorms with 4 roommates. 2 of the girls were older and friends, 1 girl we hardly ever saw because she'd always go home on weekends and moved out at the end of the semester, and the last girl was crazy. Seriously, she was nuts, but she was fun. Her name was Jody. And Jody is the reason for this story. Jody's sister also went to school there, along with her sister's boyfriend and his roommate who he'd been friends with forever. They all came from Rexburg, Idaho, and they all worked at Wendys together. Pretty tight-knit little group. Well, the night we moved in Jody was having trouble setting up her computer so she called her sister's boyfriend's roommate to come help her since he was a computer science major. I answered the door in PJs with my hair in a sloppy ponytail. I didn't really pay attention to him, just sent him to Jody's room. Later that night after he left Jody came out and told me that he thought I was cute and wanted her to set us up, so she gave him our number. Oh, and his name was Nate. I was a little suspicious of him thinking I was cute all dressed down as I was, but I said ok. Days went by, then weeks, and he never called. Occasionally I would see him on campus and say hi as I passed. Jody told me he kept losing our number, which was why he never called. One day I was bored and decided to head to Wendys to see if he was at work. I got my food and was sitting there, when he suddenly came out to get garbages. I said hi and he turned and saw me and looked so shocked. Anyway, he came and sat down with me and I told him that I heard he wanted to ask me out (a little forward of me lol). He blushed and said he'd lost our number again, so I gave it to him. And right there we set up our first date for that Thursday. The first date was great. We went to a haunted corn maze (it was cold and scary, perfect excuse to cuddle a bit) and out to dinner at a great little restaurant. We talked a lot and found out we had so much in common. I knew then that he was the kind of guy I could spend the rest of my life with. It wasn't love at first sight, in fact I thought he was kind of funny looking, it was more like interest at first conversation lol. I didn't even know his last name until after our 2nd date when he gave me his email address and it had his name in it lol. He was always so sweet, opening doors and bringing me flowers. I got my first kiss on our 3rd date (yes, my very first kiss ever!). My family liked him right away, my sister told me he was cute. He would surprise me with flowers and gifts all the time. I was very sick for a month and he took care of me, bringing me stuff I could eat. Even when my face was half swollen from an abscess tooth he still loved me :) I eventually started working at Wendys too, and it was fun to work with him. His friend had by that time dumped Jody's sister, who had turned out more crazy than Jody. He was now with another girl that worked there. In February they got engaged, and that pushed Nate to really think about us. One night after work, at 2am February 24th to be exact, Nate and I were "talking". Ok, we were making out lol. Suddenly he got all serious and said he had something he wanted to tell me but he wasn't sure how. He said he had to move. I was shocked, thinking that I'd move wherever he was going too. So I asked him where and he said Logan. Well, we lived in Logan already so I was a bit confused, to say the least. He then said he had to find a new apartment since his roommate was getting married and he wouldn't have a roommate anymore. Then he said he wanted to find a new roommate, someone he already knew and liked. At that point I started realizing where it was heading, and I couldn't keep myself from breaking out into a huge grin. He then took my hand and asked me to marry him. My first reaction was "Really?!" followed by "Yes!". It was so exciting! We couldn't stop laughing, hugging and kissing. We set a date (which was later changed), talked about where we wanted to get married and stuff. Then we realized how late it was and decided we should probably get some sleep. After he left my roommate (one of the older girls) came in and I couldn't keep it in, I blurted out that Nate'd asked me to marry him. She was the first person I told and she was happy for me. The next morning I called and told my mom, she screamed and said "I knew it!". I'll skip all the long boring details of that summer, except to say that planning a wedding is very stressful lol. July 18, 2003 was a gorgeous day. The perfect day for a wedding. The ceremony was beautiful and the reception went great. And finally we were married. We've had our ups and downs but I love him more every day. We have our 2 little boys and life is good. I am so glad we were led to each other. 3) Hamburger Helper, quick and easy works for me! Dr. Blogstein hosted this hilarious Bestest Blog Carnival with posts submitted by a ton of bloggers. It features some of the funniest posts you'll ever read. Check it out! My baby doesn't sleep. At least not long enough for me to get any sleep. He wakes up every 1-2 hours, all night, every night. I rarely get more than 2hrs of sleep at a time. Luckily hubby helps a bit and usually takes him a few hours a night downstairs. And he can't sleep this horrible forever, right? RIGHT?!? This week I'm going to tell you what works for me with bills. Before I started doing this my bill system was: get bills, throw them in coffee table drawer, hope they all got paid, months later go through drawer and sort things. Yeah, not very efficient and somehow we kept missing paying our cable bill. So I got organized. I bought a little mail sorter thing at the store. It has 3 slots. 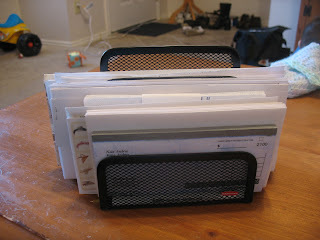 In slot 1 I put envelopes, address labels, a checkbook, and pen (stamps are always in my purse or they'd go there too). In slot 2 go bills that need paid. In slot 3 go bills that have been paid and need filed. I keep this on top of the entertainment center. I also made myself a checklist of what bills we have and what the estimated monthly amount is. There is a column to write the actual amount, and a column to check off when each one has been paid. This list is on the fridge for now so I get used to useing it, but will probably be moved to the bill sorter after a while. This is what works for me! 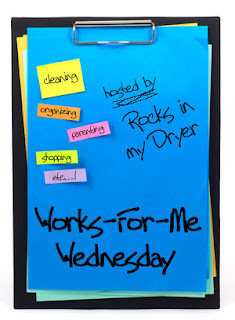 Check out Shannon at Rocks In My Dryer for more WFMW tips! So not much to do :) I have to get used to picking up after 2yr old all day again lol. Are you a hero too? Well, I won't be on anymore today, we are heading down to my parent's to pick up 2yr old. I can't wait to see him again, I miss my cute little guy. Barb at Skittles Place has given out her 2006 Blogger Awards, kinda like an Oscar but better :D I got an award for a "Blog of Note". See my pretty trophy? Congrats! You made it! Another year down, you are that much closer to death, sorry :D LOL I hope everyone has a spectacular year filled with blessings and all that you wish for. I haven't made any resolutions this year because I'd probably just forget them soon anyway, and I don't want to be disappointed if I don't do them. And now it's time for bed because it is waaaaay past my bedtime!